Home » blog » Soya sauce on Mount Fuji? It is made from porcelain, using the characteristic white clay found near the southern Chinese kiln town of Jingdezhen. It has been decorated with blue designs, brushed onto the clay surface before the object was glazed and then fired at high temperature. 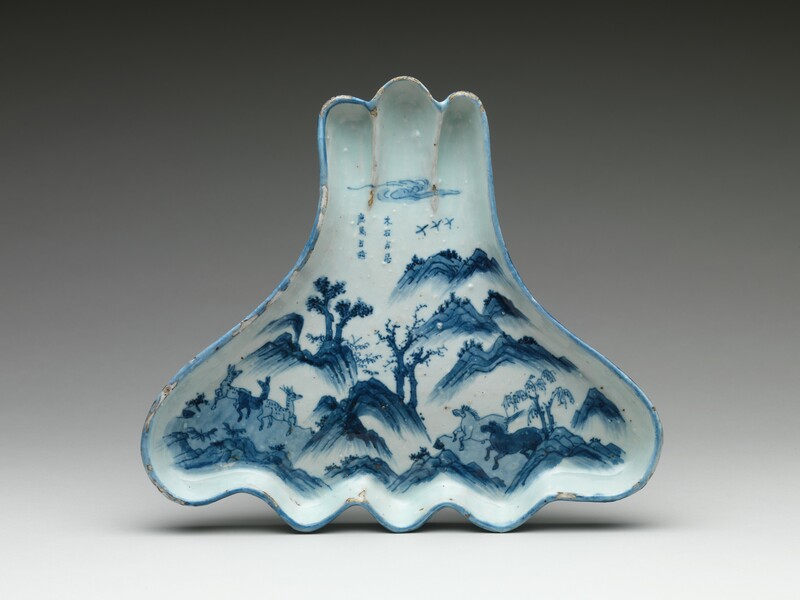 During the Ming dynasty (1368-1644), hundreds of thousands of such so-called ‘blue-and-white’ porcelains were produced in Jingdezhen, so that in itself does not explain the choice of the Metropolitan Museum of Art to select it for display in Gallery 203. The shape, however, does explain the choice. The shallow dish (5.3 cm in height) is wide on one side and narrow on the other, with rounded edges on either side of the design in the middle. Instead of laying the dish flat, one could stand it up on its wider side, with the narrow shape at the top, to reveal a shape not unlike that of the famous Mount Fuji in Japan. It is not likely that the dish was made to stand on its side; the three small feet on the base of the dish show that it was meant to stand flat on a table or other surface. Such shallow dishes were on the whole intended for serving sauces and for dipping food. The Metropolitan Museum of Art explains the images as follows: ‘it was commissioned by a Japanese tea practitioner for use in the tea ceremony. It would have probably been used to serve a light meal that preceded the tea, known as the kaiseki’. However, although we have little proof for this, might soya sauce, or a blend of soya sauce with another sauce, also have been served in this Mount Fuji dish? See the description of the gallery, Gallery 203 – Chinese Ceramics, consulted on 6 november 2014. The fact that the shape looks like Mount Fuji clearly suggests that the object was made in Jingdezhen for the Japanese market. Presumably the shape of Mount Fuji. D.C.Lau translation of Mencius, pp. 184-5. Mengzi, juan 26.14b. By atgerritsen in blog on November 22, 2014 .